The singular and exquisite poetry of pre-eminent Hebrew poet Tuvia Ruebner offers us an indispensible voice of the twentieth century. 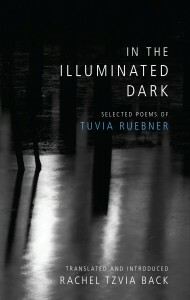 On the occasion of the publication of In the Illuminated Dark: Selected Poems of Tuvia Ruebner, Rachel Tzvia Back will read select Ruebner poems and discuss the translation process that led to this first-ever bilingual collection of Ruebner’s award-winning poetry. This evening of poetry will be introduced by Vivian Eden, Poetry Editor of Haaretz English Edition. The talk will be in English and is open to the public. The event will take place on January 8, 2015 at 19:00 at the Abramov Library, Hebrew Union College-Jewish Institute of Religion Jerusalem Campus, 13 King David Street; telephone 02-6203333. The event is presented in loving memory of Nate (Nissan) Back. Order your copy of In the Illuminated Dark today!